The world’s population, and Australia’s, is ageing. The number of adults aged 65 and over is increasing, as is the proportion of the population they represent. However, there are a number of myths associated with what happens to our brain and bodies as we age. Dementia prevalence increases with age. That is, your chance of having a diagnosis of dementia is greater the older you are. But if you are lucky enough to reach old age, you won’t necessarily have dementia. Dementia is a clinical diagnosis that is characterised by impairments in cognition (the way we think) and functional abilities (that enable us to live independently). The major type of dementia is Alzheimer’s disease, although there are many other types, such as vascular dementia (related to vascular changes in the brain such as stroke), frontotemporal dementia (brain atrophy most pronounced in temporal and frontal cortical regions of the brain), Lewy body dementia (related to a particular protein deposit called a Lewy body) and mixed - where different types occur at the same time. However, less than 2% of adults 65-69 years of age have a dementia diagnosis, and this rises to over 30% for those 90 years and over. The flip side of this is that nearly 70% of those aged 90 years and over don’t have dementia. In Australia in 2014, the median age at death was 79 years for males and 85 years for females; so, most of us won’t die with a dementia diagnosis. Cognition refers to the way we think, but there are lots of types of thinking skills. For example, the speed at which we can respond (processing speed), our ability to remember objects (general memory), and our knowledge of words and their meaning (vocabulary knowledge). These cognitive domains show different patterns of change across adulthood. Processing speed and general memory do appear to decline from the 20s, which means we are slower at responding to relevant cues and a bit more forgetful as we age. But this is not the case for vocabulary knowledge. On average, we will reach our peak word knowledge in our 60s, and our performance will not markedly decline after that. 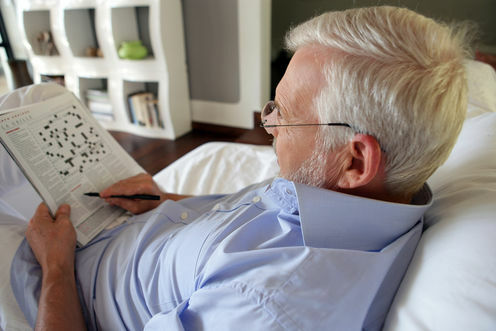 In fact, multiple studies show the older your age, the better your performance on the New York Times crossword. It has been estimated that up to 30% of worldwide dementia cases are preventable through lifestyle choices. Evidence shows mid-life heart factors, especially diabetes, high blood pressure, obesity and physical inactivity, increase the risk of developing dementia in late-life, as does having depression, smoking and having low educational attainment. So, one way to decrease your risk of dementia is to reduce your heart risk factors - for example, exercise more and reduce your weight if you are obese. Engaging with cognitively stimulating activities such as formal (such as university) and informal (such as short-courses) education, and social meetings, has been shown to reduce the risk of dementia. This evidence ties in nicely with recent studies from Europe and the US, which have demonstrated an individual’s risk of dementia has actually decreased over the past two decades. Why? Well, it is appears that older adults are now more physically and cognitively healthy than their predecessors. Late-life dementia, which is diagnosed when you are 65 years and over, is only influenced slightly by the genetics your parents passed onto you. Nine genes have been identified that either increase or decrease your risk for dementia. There is one that carries some influence: apolipoprotein E. If you have one combination (E4E4 alleles), you are at 15 times more likely to get dementia as someone with the more typical combination (E3E3). However, all other identified genes have only a small effect, with each putting you at a 20% increased or decreased risk of developing the disease. To put these genetic risks in perspective, they are smaller than each of the lifestyle factors mentioned above. That is, dementia is more likely to be caused by obesity (60% more likely) or being inactive (80% more likely). These comparisons are not perfect, as it may be that genes related to dementia also relate to these lifestyle factors, but it does show how powerful lifestyle factors are. Simple physics energy laws tell us that if the calories we are eating match the energy we are burning, our weight will essentially be stable. Most people believe in this simple and truthful nutritional dogma, but fail to take into account the significant effects of ageing on energy metabolism. As we age, our body composition changes. In particular, we tend to have a reciprocal change in fat (increase) and muscle (decrease), and these changes appear to be different in men and women. Men appear to have a steeper decline in muscle tissue, which accounts for a decline in the total energy expenditure of about 3% per decade. In women, the rate is slightly slower compared to men (about 2% per decade). This simply means if you continue to eat and exercise at the same level as you age, you will likely gain weight, and this will mostly consist of body fat. Ageing is not a passive biological process. We need to better understand our body and its changes if we want to maintain health and prevent the onset of diseases such as dementia. Hannah Keage had received funding from the NHMRC and Brain Foundation. She is affiliated with the Australasian Cognitive Neuroscience Society and Australian Association of Gerontology. Blossom Stephan has received funding from NIHR, Alzheimer's Research UK and the MRC. Should I worry if my child is pigeon-toed or duck-footed?